July 16, 1969. Apollo 11 Launch. Saturn V F-1 rocket engine, the most powerful single thrust chamber ever developed, disengages… plummeting into the Bermuda Triangle and impaling itself 3 miles deep into the ocean floor, a mile deeper than the Titanic! March 2012. Amazon CEO, Jeff Bezos, underwrote a private – and secret- expedition to recover the Apollo engines. The ship, Seabed Worker was a technological dynamo with a non-propeller system of vertical blades allowing it to hover over the underwater wonderland of Apollo treasures. The yearlong operation coordinated with NASA to search the sea’s coordinates for Apollo’s engineered masterpieces. March 20, 2013. F1 Saturn V Engine Recovery was an incredible historical achievement. 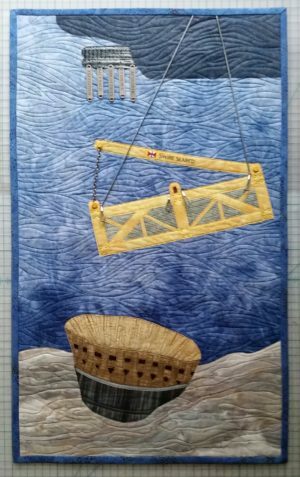 The Swire Seabed basket, a remote operated vehicle (ROV), was lowered from the ship by synthetic fiber cables stronger than steel. As the ship heaved and pitched in high seas, the delicate ballet of the basket cradle tethering from the ship was taking place underwater, preparing to unearth 10 tons of magnificent metal. The 12′ wide and 18.5′ deep engine made its “soft landing” with a thrust of 32 million horsepower. The expedition’s pinnacle of achievement was further elevated to historic status when a conservator, scanning the F-1 artifact with a black light, discovered the serial number 2044, identifying it as the center engine chamber of Apollo 11. 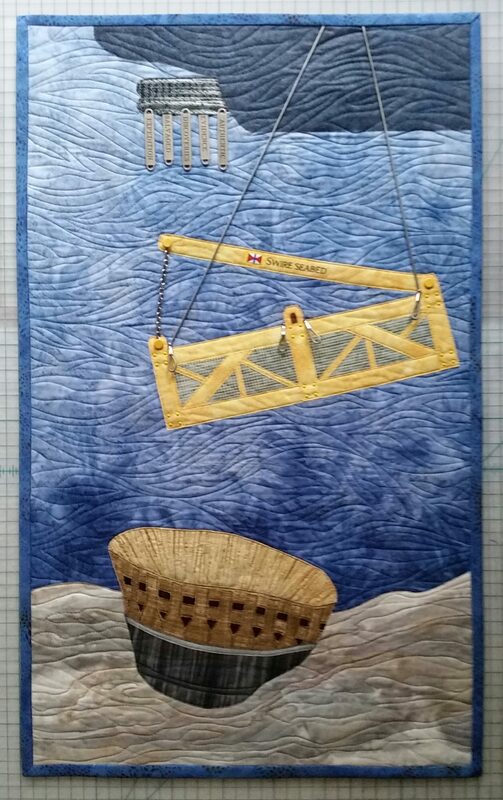 “Soft Landing” is free-motion quilted with metallic thread. Engine chamber details are hand-painted and thread-painted. Ship constructed of sheer fabric with metallic zipper blades. Basket embellishments incorporate drywall mesh, chain, vinyl cording and metal paper fasteners covered with nail polish. Black MistyFuse under sheer organza, Sulky metallic thread, Aurifil gradated metallic thread, Aurifil rayon threads, Shiva oil paintstiks, plastic drywall mesh, metal mini brads, metal paper fasteners, chain, vinyl cording, and nail polish.